The parents and relatives of the disappeared normalist students have rejected the version presented by the Federal Attorney General’s Office (PGR) that the youth were burned and reduced to ashes in the garbage-dump of Cocula, Guerrero. The families held that the remains of Alexander Mora Venancio, the only one of the 43 students who has been identified, were provided by the government to maintain the version of the three narco-hitmen who confessed to burning the remains of the students after killing them. “The Argentinian investigators cannot confirm that these remains were found in Cocula, because they were not present at the time of the discovery of the remains [of Alexander Mora], such that the black bags containing the remains were open,” said a representative. The director of the Institute for Forensic Medicine in Innsbruck, Austria, affirmed that expectations are “very low” that the laboratory will be able to identify the human remains that were presumably found in Cocula, because the conditions to which they were consciously exposed converted them to a “very challenging” state. 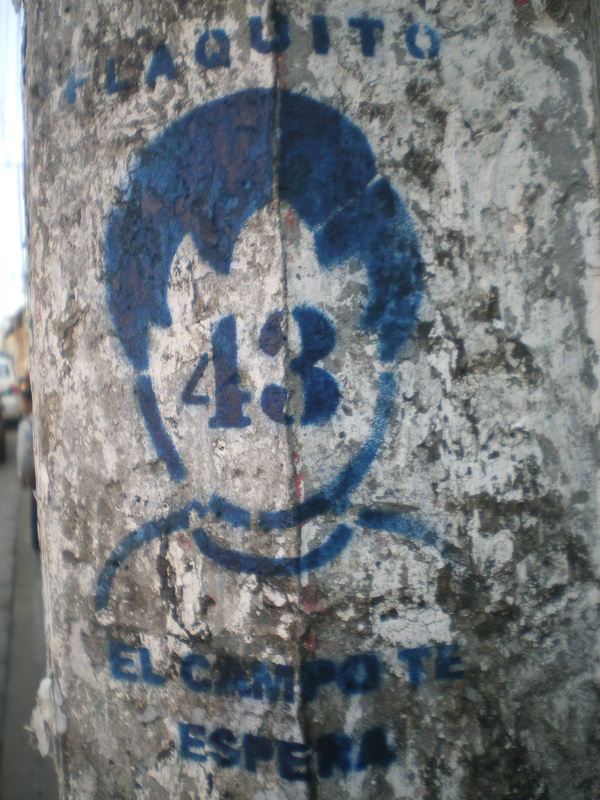 Beyond this, civil-society organizations have defended the legal representatives of the families of the 43 students disappeared by the police in Iguala, after it was reported that the Center for Investigation and National Security (CISEN), associated with the Secretary of Governance, had qualified them as a “danger for governance,” making reference to members of the Tlachinollan Mountain Center for Human Rights. In a communique, 19 human-rights organizations denounced and lamented that the government would try to discredit human-rights defenders and use public resources to weaken the movement for the disappeared in place of employing the capacities of intelligence agencies to combat the infiltration and corruption of the “narco-State” and ensure that grave human-rights violations do not remain in impunity. On 3 December, the UN Office of the High Commissioner for Human Rights (OACNUDH) visited the Rural Normal school of Ayotzinapa to meet with relatives and friends of the disappeared students. 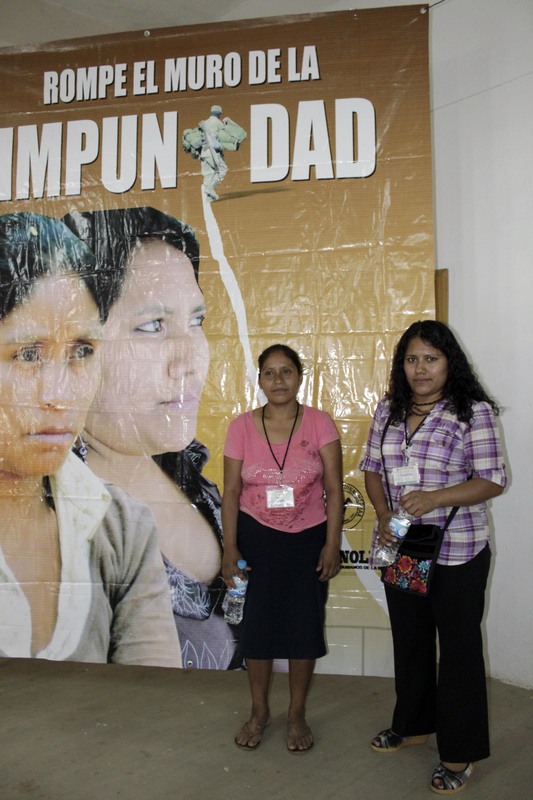 The visit was part of a follow-up campaign that the OACNUDH has provided in the case. The Office reiterated its solidarity and energetic denunciation of the events of Iguala. 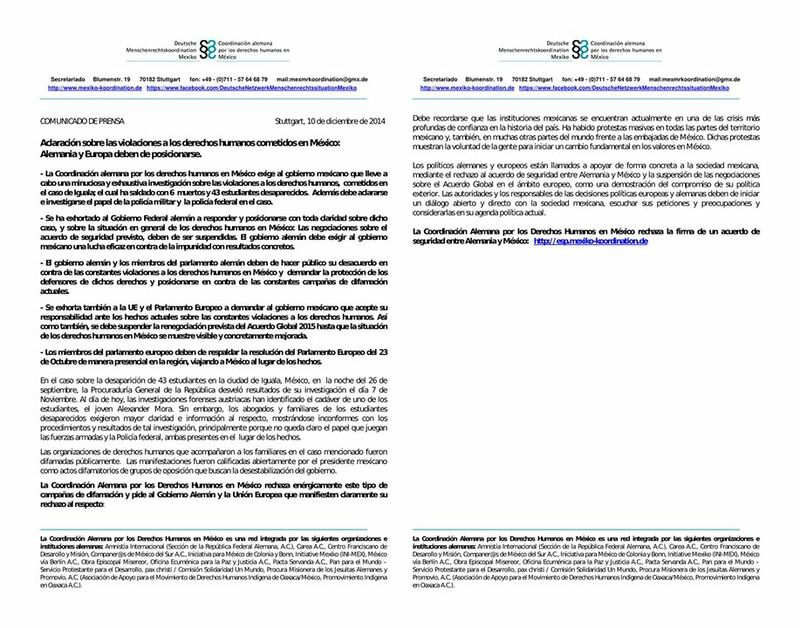 In a communique from 10 December, the German Coordination for Human Rights in Mexico demanded that the government of Enrique Peña Nieto clarify the role played by the Mexican Army and federal police in the disappearance of the 43 students. In this way, it also demanded that Angela Merkel’s government suspend negotiations regarding security agreements with Mexico until the latter government provides a report on the general situation of human rights in Mexico. On 10 December, the German daily Tages Zeitung reported that at least 36 of the weapons presumably used against the normalist students of Ayotzinapa were G-36 German assault rifles, produced by the Heckler & Koch corporation. A day previous, on 9 December, deputies of the green parties in the European Parliament protested inside the parliament building in Brussels, demanding that the Mexican government use all possible means of finding the disappeared students from the Raúl Isidro Burgos Rural Normal School alive. 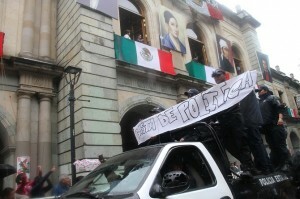 Since 14 September, some 600 state police officers of Oaxaca have been on strike to demand the resignation of the Secretary for Public Security, Alberto Esteva Salinas, and the commissioner of the State Preventive Police, Cuauhtémoc Zúñiga Bonilla, in addition to other police chiefs, whom they accuse of corruption and of embezzlement of public campaign funds. Based in the barracks of Santa María Coyotepec, they denounced that 2.5 million pesos worth of travel allowances had yet to be paid, and they manifested being tired of arbitrary actions, demanding an increase in salary, the provision of uniforms twice a year, and an eight-hour workday. 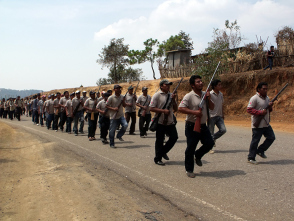 Similarly, the coastal region saw a similar police strike, while in the Tehuantepec Isthmus, police were arrested by Mexican Army units as they traveled to the capital city to support the action. On 16 September, half a hundred state police invaded the end of the commemorative march to march the 204th anniversary of the beginning of (formal) independence for Mexico, an event which was not attended by Governor Gabino Cué Monteagudo. Using the slogans “Enough of politics” and “Out with the corrupt [ones] Alberto Esteva and Cuahutemoc Zuñiga (sic),” among others, police demonstrated their repudiation of the situation and showed the bad state of the equipment they use, in addition to uniforms, which were shown to have damaged logos, discoloration, and other damages. On 18 September, the president of the Permanent Commission for Citizens’ Protection and Security from the local congress affirmed that an initial agreement had been made to pay the travel allowances in arrears, as well as to provide uniforms and boots to police. Nonetheless, other media mentioned that Esteva Salinas, Secretary of Public Security, fired 153 members of the State Preventive Police, who are presumed to have initiated the strike. It should be recalled that this is the second police strike this year. The first took place in March, when police in revolt also requested ameliorative reforms and resignations.